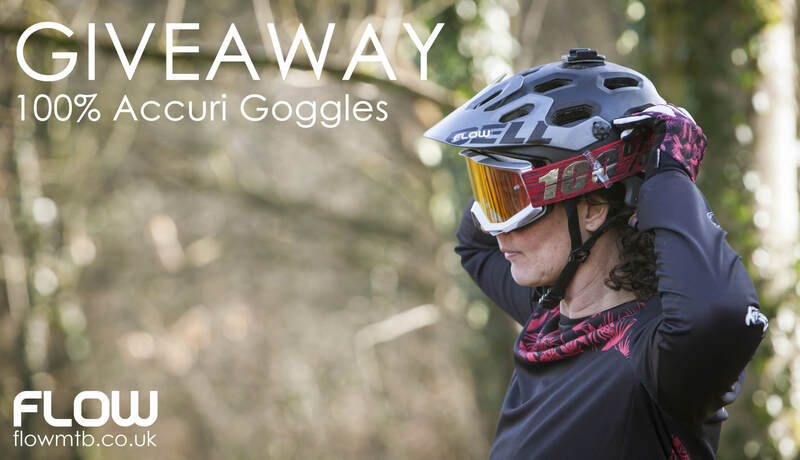 Giveaway is being run by Flow MTB. Competition ends on Sunday 31st March at 23:59. 1 winner will be chosen to win the hat. Flow MTB will announce the winner on Monday 1st April. Winner must live in UK. No purchase necessary. Instagram, Facebook and Twitter are in no way associated with this giveaway. Giveaway is being run by Flow MTB. Competition ends on Friday 22nd March at 23:59. Winner will be chosen at random.Flow MTB will announce the winner on Monday 25th March. Winner must live in UK. No purchase necessary.Instagram are in no way associated with this giveaway. 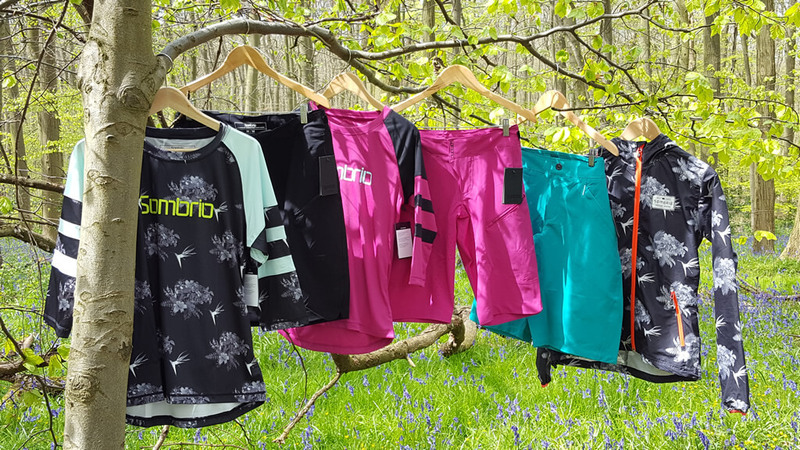 Stuck for Christmas gift ideas for the female mountain biker in your life? 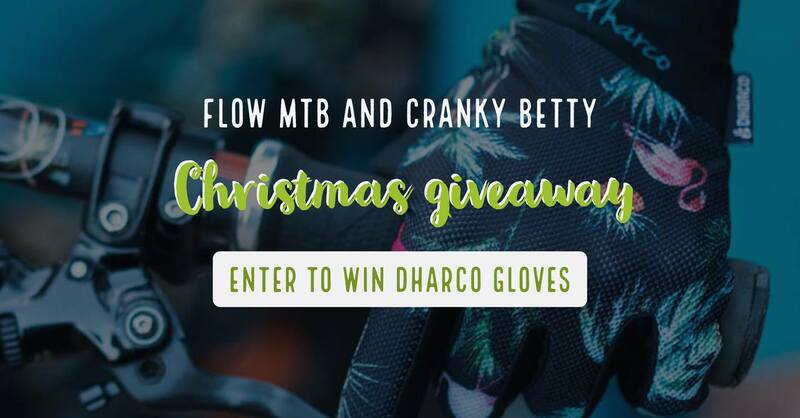 Take a look at Cranky Betty’s “12 Best Christmas Presents for a Female Mountain Biker” for some inspiration and enter their competition to WIN a pair of DHaRCO gloves in your choice of flamingo, baby blue or ruby stars. The average size of our weekly rides at Woburn is 10; usually a mix of 7 men and 3 ladies. 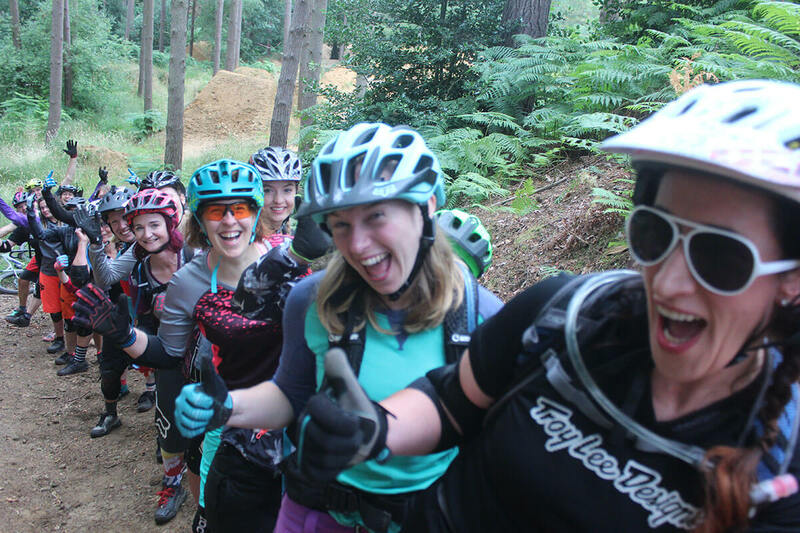 So to see 18 women rock up and take part in our ladies mountain bike weekend was amazing! The weekend came about after a conversation with Sandy from GirlBikeVan about doing a collaboration weekend. 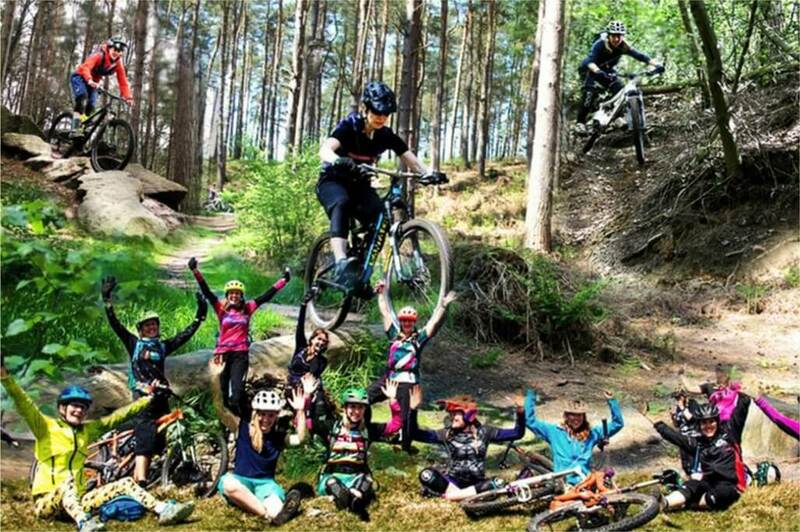 We got our heads together and came up with the idea of a competition for women to enter and win a weekend of mountain biking and skills coaching. The Saturday would begin with a coaching session followed by a ride around the Woburn trails and Sunday a fun day at Chicksands Bike Park and, in true GBV style, there would be camping. The lovely guys from MTB Instruction agreed to help us out and boy did they deliver! Saturday morning started with their core skills loop where they take everything back to basics. They kicked off with balance and speed control and to put a fun element to it, a slow race where we got to practice track stands. Keeping with balance MTB Instruction had put together some balance boards which started off in a low straight line and then, as we became more proficient, these were kinked and raised until eventually we ended up with a kicker to experience drops. Next came the seesaw, time to really put balance skills to the test! We then moved onto bike control. The guys had set up a slalom course from cones; first run through we were told not to use any brakes, then next run through with brakes so we could feel the difference between being in and out of control on your bike. The cones were later moved further apart so we could practice foot placement and flat corners. The skills loop was an excellent start to the day. The games helped everyone relax and gave us the opportunity to meet each other. Having the skills loop outside of the woods let us practice our skills in a controlled environment and gave us the confidence to head off on the trails. Next stop, lunch! After lunch we headed up to Woburn Bike Park. Here we sessioned some berms and for those that wanted to push their skills a little further some gaps and drops. A pedal out of the bike park and across to some rooty descents, technical downhill sections and back towards the car park for drops, gaps and some spectacular log drop gymnastics from Anna. Sunday morning started with a warm up on the dual slalom at Chicksands. I’ve only ever seen this many women at Chicksands once, and that was on a race day. There were quite a few complimentary comments about how good it was to see so many women out riding and they didn’t seem to mind the queue we caused at the start ramp! The group then naturally split into smaller groups to session different parts of the park and practice features they wanted to improve; rooty descents, drops, gaps. Before we knew it it was time for lunch and the famous Thai van and Flow goodie bags for all the ladies. We then proceeded to take over the car park as the ladies tried on kit from Flow MTB. Sadly it was then time to say goodbye to new friends and the end of an awesome weekend. Sandy from GirlBikeVan for helping coordinate and generally being an amazing women and getting out there and inspiring others to ride. Check out the GirlBikeVan Facebook page for details of rides near you. Mark for all the photos of us in action and making us look rad! Deadline for entries is Friday 16th June at midnight. Winners will be chosen by Monday 19th June at midnight and contacted by email in the following 2 days. Places are limited and the number of places is at the discretion of GirlBikevan, Flow MTB and MTB instruction. Contact details will be used for general marketing purposes by GirlBikeVan, Flow MTB and MTB instruction. We will not pass your details to 3rd parties. Images and video footage taken on the day will be used for promotional purposes on social media. Copyright laws associated with the use of images and video will apply. Competition entry is for ladies only who have a good level of skill and general fitness already and want to push the boundaries. 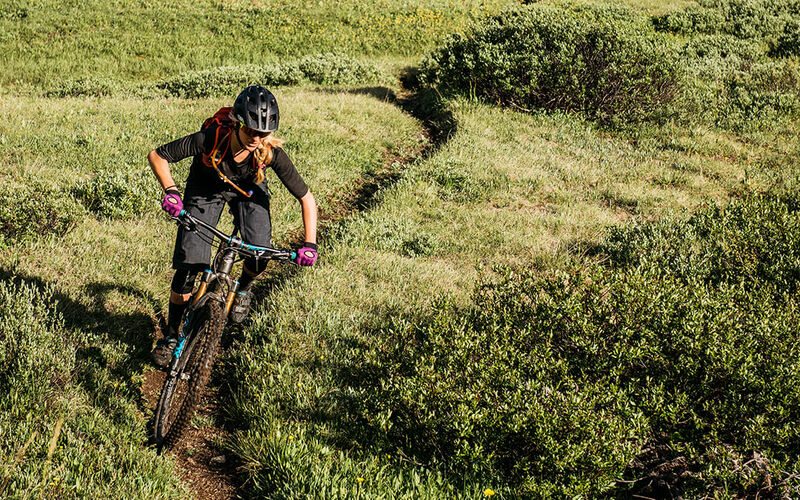 This is not a weekend for beginner mountain bikers. If you can ride red trails and all of their features confidently and at a good pace this will be the weekend for you. You are responsible for ensuring your bike is in working order, booking your own accommodation, traveling and paying for your own meals. Full itinerary with accommodation suggestions will be sent to the winners. Tags: Flow MTB Competitions, MTB coaching, MTB Instruction, WIN! 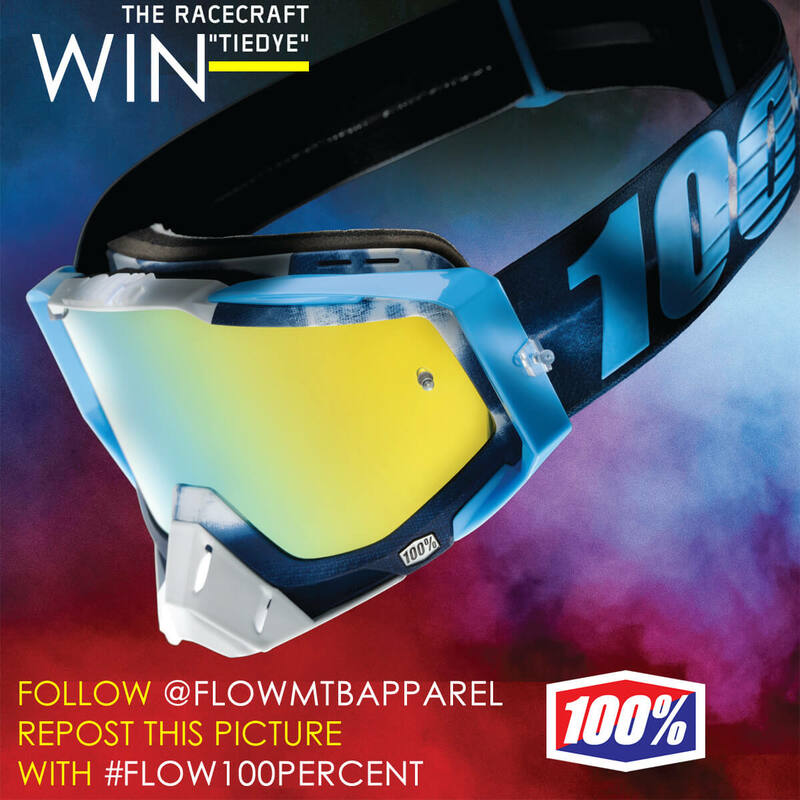 WIN a pair of 100% Racecraft Tiedye goggles as worn by our Flow MTB race team. The closing date for this competition is Friday 26th May, 2017. After this date no further entries will be permitted. One winner will be selected at random. The winner will be contacted via Instagram on Monday 29th May, 2017. The competition is being run by Flow MTB Limited. No purchase is necessary to enter this competition. The winner of the competition will win one pair of 100% Racecraft Tiedye goggles. This competition isn’t sponsored, endorsed or administered by, or associated with Instagram. Tags: Flow MTB Competitions, Sombrio, Sombrio Lily Gloves, Sombrio Pedigree jersey, Sombrio Summit Shorts, WIN! This competition is now closed. Like us on Facebook to keep up to date on all our competitions. The closing date for the competition is Monday 31st October, 2016. After this date no further entries will be permitted. One winner will be selected at random on Monday 31st October, 2016. The winner will be notified by email on Monday 31st October, 2016. The competition is being run by Flow MTB Limited. No purchase is necessary to enter this competition. 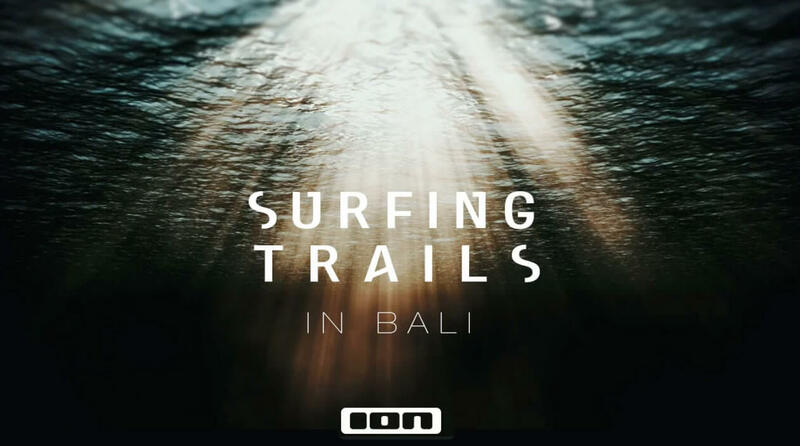 Could this be some of the best Mountain Biking terrain in a place known only for Surf? In Bali, Indonesia you can literally shred a volcano all the way down to the beach. We’re giving one lucky winner the chance to win some amazing protection from leading brand ION. Light, breathable elbow pad with a very slim outline. Good impact protection by a combining thin SAS-TEC padding with a hidden hard cap (to distribute loads in case of a crash). The unique Snug_Loop construction keeps the pads in place, even on those super long tours. A light, breathable and pedal friendly kneepad with a very slim outline. Good impact protection by a combining thin SAS-TEC padding with a hidden hard cap to distribute loads in case of a crash. Extra wide silicone ribbons on top and bottom keeps the pads in place at any time. Now equipped with a zipper for getting into the knee protector nearly on-the-fly! Light gloves with some additional ‘Overinjected Protection’ for your fingers. The palm is made from a single piece to avoid irritating seams and give you an excellent feel for the handlebars. The ‘Digital Tips’ feature makes it easy to use your GPS app or answer a call with your gloves on. Like us on Facebook to keep up to date on all our competitions. The closing date for the competition is Friday 29th July, 2016. After this date no further entries will be permitted. One winner will be selected at random and the winner will be notified by email. Tags: Flow MTB Competitions, WIN! The closing date for the competition is Thursday 30th June, 2016. After this date no further entries will be permitted. One winner will be selected at random on Friday 1st July 2016. 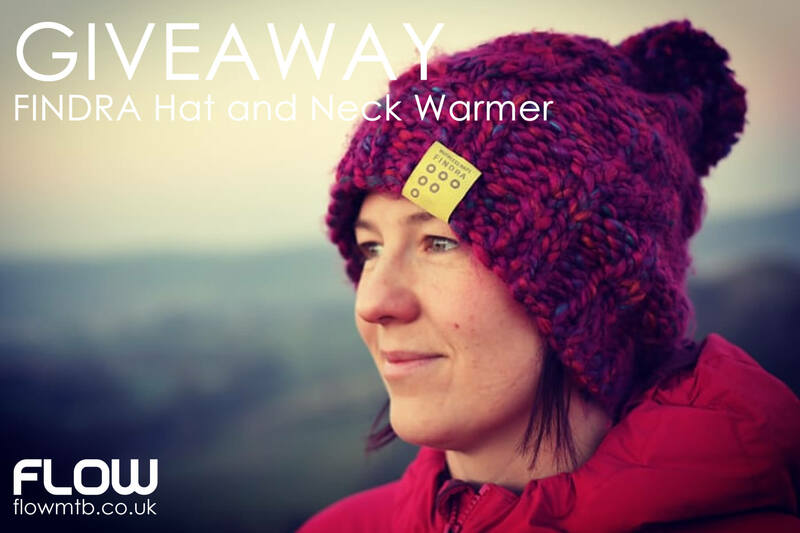 The winner will be notified by email on Friday 1st July 2016.